Jeremiah JH 5003. 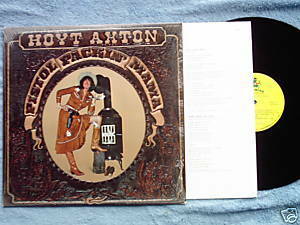 Hoyt Axton. Pistol Packin' Mama. 1982 LP. Tracks are SHE'S TOO LAZY TO BE CRAZY, PISTOL PACKIN' MAMA, I WALK THE LINE, DON'T FENCE ME IN, THERE STANDS THE GLASS, WARM STORMS AND WILD FLOWERS, HE PLAYED REAL GOOD FOR FREE, JAMES DEAN AND THE JUNKMAN, INDIAN SONG, FEARLESS THE WONDER DOG. Musicians accompanying Hoyt Saxton include Donna Axton, Lara Lee Dare, Carol Hunt, Bruce "Buffalo" Barlow, Mark Dawson, James Burton. Produced by Hoyt Axton and James Burton. Vinyl is VG/VG; cover with photos, protected by original shrinkwrap, is VG with minor corner wear; inner sleeve has lyrics.